Angela Huapaya I am the first generation born here in the Bay Area. My mother was born in Klamath Falls, Oregon where our Tribe is from and my father was born in Peru. I was also what you may call an only child, being that I was raised alone with my guardian…when I had one. Some might say that growing up alone and fast had many setbacks, but I like to think of it as giving me the tools and skills I would need to survive in a world that has you labeled as doomed. I had this great opportunity to learn how to cook, clean, socialize, work, speak up, and question authority at the very young age of 11- years- old. Living on the streets of the Fruitvale District and Mission District was hard, yet it has motivated me and given me great assets to learn how to deal with a world that seems to know what you need before you do. Angela Scott I grew up on the border of San Leandro in Sobrante Park, deep East Oakland. I am a student at Laney College but I am in the process of transferring to Mills College, the all women’s university in Oakland. There, I will be majoring in Ethnic Studies with a minor in Women’s Leadership. At Laney, my major was English. I am an avid reader and lover of all things poetic. I enjoy music of all kinds, art, great food and spirits, traveling across the country and abroad and having unique experiences and sharing them with anyone willing to listen. This project sparked my interest because the city of Oakland is so misunderstood. Oakland is a large and diverse city and because of the racial and economic makeup, I believe that it is easy for people to prejudge it. Bill Joyce Bill Joyce is a retired Berkeley teacher and 2016 alumnus of Oakland Voices. Carlos Gonzalez I'm as Oakland-ish as can be. From an early childhood, I remember a fun and carefree life and lots of sunshine and laughter. I remember my father, for example, stowing his swim gear in a light blue denim bag secured with white nylon cords and a charcoal seahorse emblazoned on the light blue pouch. We would then all climb into the station wagon, including our little mutt dog named Pucci, and drive to Alameda beach. Joymara Coleman I was born in Oakland, California at Highland Hospital. I am the fourth of my mother's eight children. I grew up in the foster care system and I've lived in more than 10 placements, mostly here in Oakland. 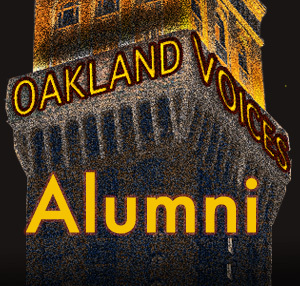 I attended Oakland public schools up until I started high school at Berkeley High. After receiving my GED, I enrolled in community college. I attended Merritt college and studied in the African- American studies department. I was gifted with the opportunity to study abroad in Central America. I am interested in serving my community and uplifting the youth. Marilu Aguilar I found myself in East Oakland through a series of events that affirmed my passion for social justice and community service. As a southern California native, I witnessed socioeconomic disparities that fed tension among communities and disenfranchised entire groups of people. These experiences led me to pursue higher education at Long Beach City College, where I studied English Literature as a means to better articulate and understand the world around me. Mustafa Solomon I have been a professional photographer for over 30 years. I am also a videographer, a lover of jazz, sports (boxing, basketball, and football), and fashion. I am a native of Newark, New Jersey. I am one of 13 children who were raised to always try to achieve our best and to give back to others in the process. Currently, I am a grassroots community activist and a member of many organizations such as Causa Justa/Just Cause, Black Lives Matter, and the East Oakland Building Healthy Communities initiative. My activism is centered on social justice issues, especially in the communities that are supposed to represent Black and Brown people. Randy Filio After High School I bought my own 35 mm camera, some lenses for it and I started taking pictures of random things trying to find a style for my photography. Most of my photos were close ups of abstract objects, dead/dried animals and plants, rusted metal, unusual shapes of items, double exposure photographs and anything that got my attention. I started putting a portfolio together with my best prints and continued to photograph. I like to slightly distort the way things really look and alter the colors and/or lights around my subjects to create some type of life or action within my photographs. Rosalinda Hernandez I am an Oakland native and graduated from the California Polytechnic State University, San Luis Obispo, with a bachelor's degree in Political Science in 2003. While at Cal Poly, I was a member of Sigma Omega Nu and was the resident advisor for the multicultural tower of Yosemite Hall during the 2000-2001 school year. My passion for education and Oakland inspired me to focus my senior project on the state takeover of the Oakland Unified School District in 2003. After graduation, I returned to Oakland and was an AmeriCorps member in Oakland from 2004-2005, working on community building in Sobrante Park. Sabah Williams I am a mixed race woman who grew up in a Native-American community in Oakland, Ca. I attended many Native-American ceremonies, Pow Wows, and cultural events. I am very proud of my Native-American heritage, and I also hope to learn more about my African-American side of the family. Saleem Gilmore I am an Oakland native who grew up in the early 1970's. My parents moved the family to Texas in the 1980's to get my brother and me away from the violence of the neighborhood. I returned in the early 1990's for good. I became a classroom teacher and found my niche working with African American boys. I later began working in community based organizations. For over 25 years, I have worked in the Bay Area. My interest in media grew out of my attempts to keep up with my students and their new forms of communication. I am ready to take my experience to the next level through training, peer exchange and doing.